Let’s take a blast to the past  years before Victor, Kai, Branch, and Silvio stepped on a pro stage. Our journey will bring us back to the legendary years ruled by the one and only “Dragon Slayer,” who won the very first Arnold Classic. Shortly after winning the NPC Junior Nationals at age 20 in 1983, Rich Gaspari was featured in Flex magazine. He had teamed up with the new threat to the Mr. Olympia crown, Lee Haney, and southern California possessed the hottest dynamic duo since Arnold and Franco trained together a decade earlier. As Haney trained like a mad man in his attempt to win the Mr. Olympia, Gaspari, not be to be outdone, was gunning for his pro card. Rich needed to win his class at the NPC Nationals to qualify for the IFBB Mr. Universe, which is now the World Championships. If he won the Mr. Universe, he could turn pro. He won both the Nationals and the Mr. Universe title and he indeed turned pro. I watched Gaspari win the Mr. Universe on TV in the fall of 1984, which was my senior year in high school. (Yeah, both the Mr. Universe and Mr. Olympia were shown on ESPN back then.) Gaspari came walking out onto the Caesar’s Palace stage to the song “Relax” by the one-hit-wonder group, Frankie Goes To Hollywood. The 21-year-old Gaspari exuded a relaxed confidence beyond any of the other competitors in the lightheavyweight class. Second-place finisher, Josef Grolmus was no match for the ultra-ripped Dragon Slayer. In the spring of 1985, Rich Gaspari made his pro debut at the IFBB Night of Champions where he shocked the bodybuilding community. He weighed 16 pounds more than his win at the Mr. Universe a few months earlier and he displayed even better conditioning. When Gaspari turned around and showed his back to the audience, the era of striated glutes began. Albert Beckles won the show, but Rich placed a solid second and a few months later, he placed third at the Mr. Olympia where his former training partner, Lee Haney, won his second Mr. Olympia title. Rich Gaspari captured his first IFBB pro win at the 1986 Pro World where he again improved his conditioning. During the next three years of his competitive career, Gaspari went on to place second at the Mr. Olympia. He won several European Grand Prix competitions. In the spring of 1989, Gaspari won the Arnold Classic, which was formerly known as the Pro World Championships. That was his last IFBB pro win. He finished a respectable fourth and fifth in the next two Mr. Olympias, but slipped down to 10th at the 1991 Mr. Olympia. He competed for a few more years and retired after finishing 12th at the 1996 Florida Cup Pro. Rich Gaspari was one of the hardest training bodybuilders during the 1980s, which is why Lee Haney snagged him for a training partner while Rich was still in the amateur leagues. Big Lee needed someone who could hang with him and push him to the new levels required to become Mr. Olympia. 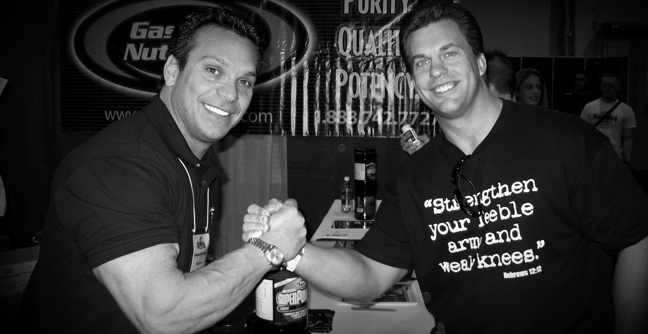 With his incredible willpower and drive, Gaspari was the man who could do that. Gaspari used an old-school style training method, which would probably cripple some of the younger pros these days. He trained six days per week with two grueling workouts with the weights per day. On top of that, he managed to fit cardio and posing practice in between those two-a-day workouts. He followed a three-day cycle so every body part was trained twice per week too. (Remember, it was still a few years before Dorian would turn the bodybuilding world upside down with his new hit-a-body-part-once-per-week training style.) The “Dragon Slayer” included multiple advanced training methods as drop sets, forced reps, supersets, super slow-mo reps and various others to crank up the intensity. Gaspari also believed in training in a very strict without cheating during the movements. He learned that lesson in an inadvertent manner. Early in his career he was training his back and performing cable rows. He was using an impressive amount of weight and using a loose style with plenty of lower back movement to hoist the weight. During one of the sets he felt something pushing on his back between his shoulder blades. It prevented him from pulling the weight up. When he slammed the weight stack down and got ready to yell at the idiot who placed a knee in the middle of his back, he was stopped cold. The owner of that knee was none other than Joe Gold and he told the mighty Rich Gaspari that he was cheating and he ever wanted to really train his lats, he needed to lighten the load and stop hoisting up the weight. Rich humbly followed that great advice. And his back improved immensely. Done with up to two people on his back and a dip belt with added weight. Drop sets were incorporated by having one person get off his back, then the other, and then the loaded dip belt. Increase weight each set and the last set would be a triple-drop set. Increase weight each set. Last set using drop set. After retiring from professional bodybuilding competitions, Rich Gaspari took on the new challenge of building a sports nutrition company with the same tenacity and drive that made him a champion on stage. Rich and his team of experts in sports science have developed a line of supplements under his name, Gaspari Nutrition. His love for the sport of bodybuilding and the desire to make effective sports nutrition products, has made Gaspari Nutrition one the largest companies in the industry. Gaspari Nutrition sponsors many bodybuilding competitions and several athletes including IFBB pros Flex Lewis and Cathy LeFrancois. NPC athlete, Mark Alvisi is also a Gaspari-sponsored athlete and so is Marzia Prince, 2007 Ms. Bikini Universe Champion. If you’re able to attend the Arnold Expo this year, stop by and say hi to the first Arnold Classic Champion and his team and be sure to pick up a few of the samples they give away during the weekend. Rich is convinced that you’ll like his products. “For those of you yet to try our products, I invite you to do so. Try them once and I’m confident you will see and feel, once and for all, what everyone else is talking about,” Rich states with the same confidence he emitted on stage.